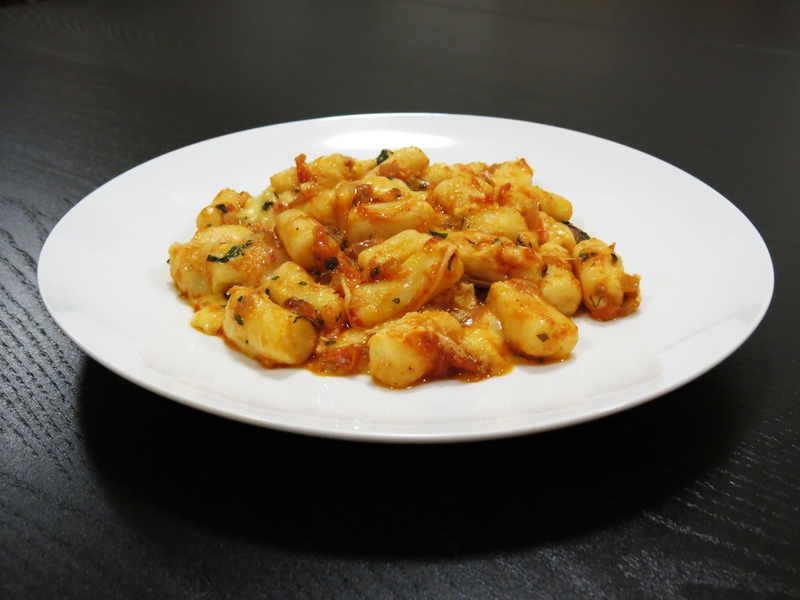 Gnocchi are considered to be a type of dumpling and they are extremely soft and light. I know nuts about them before I came over to Australia. Two years ago I was at an Italian restaurant at Lygon Street in Melbourne and decided to try the dish with the cute name called Gnocchi Gorgonzola. It was pleasantly tasty. The second time I tried gnocchi was at Sapore, a one hat restaurant at St. Kilda. The gnocchi was absolutely divine. They were lighter, fluffier and softer compared to the ones at the previous restaurant. I enjoyed gnocchi so much that I decided to make it at home one day. At that time, I was too lazy to make the potato gnocchi myself so I bought the pre-made ones from the supermarket and mix it with my homemade sauce. It was clearly a bad choice as I barely touched the dish. The sauce was OK but the problem lay in the store bought pre-made gnocchi. They tasted appalling and due to the high flour content, they were super tough, gluey and tasteless. 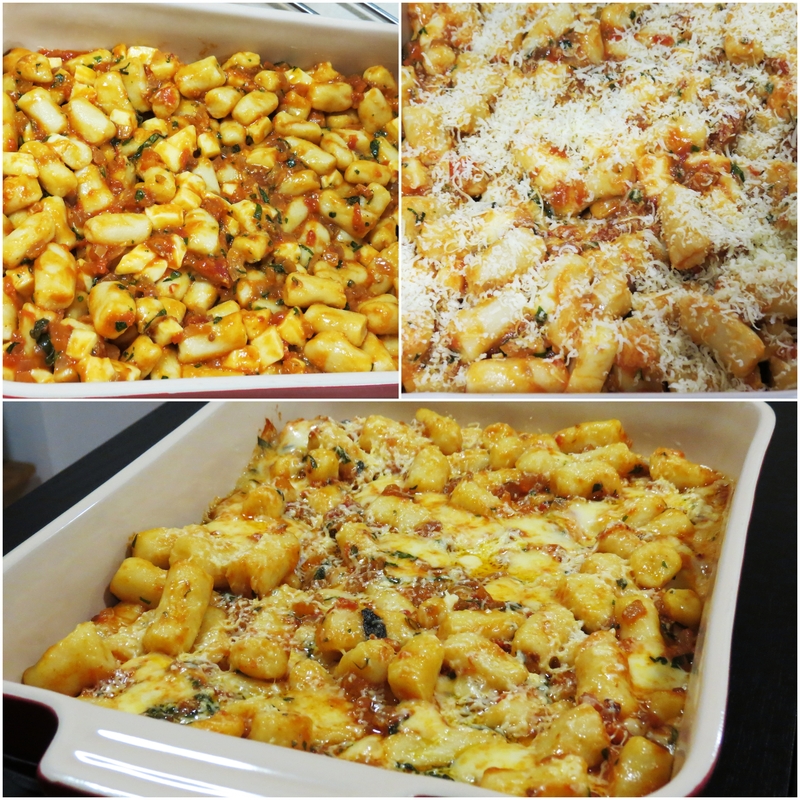 Last weekend, I decided to re-visit my gnocchi dish and this time I did not take any shortcuts. I made everything from scratch and it was extremely fruitful and rewarding. Be careful not to add too much flour to prevent it from being too heavy and hard. The thick and dense tomato sauce combined with the melted cheese enveloped the pillowy soft gnocchi creating a silky smooth sensation in your mouth. The sauce is simply marvelous. Simple yet packed with flavor. 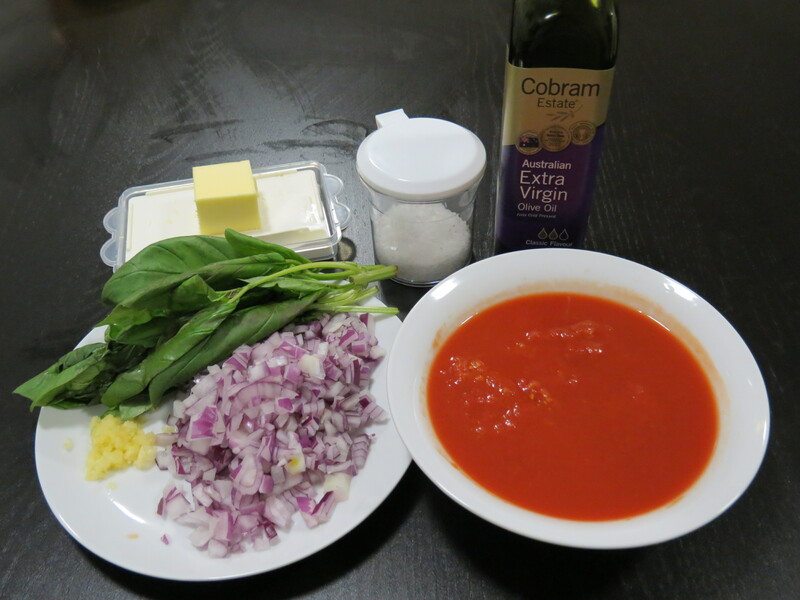 Ingredients for the tomato sauce. Pass the tomatoes through a mouli or squish them with your hands. Set aside. Heat the olive oil in a large heavy-based saucepan over medium heat. Add the garlic and stir until it starts to color. Add the onion and saute until it becomes soft and translucent. Add the crushed tomato, basil and salt to taste. Simmer gently for 20 minutes until the sauce is nice and thick. Discard the basil, add the butter and stir. Set aside. Place the potatoes in a saucepan of cold salted water. Bring to boil, then turn the heat down a little and cook gently until the potatoes are soft when tested with a skewer (takes approximately 20-25 min). Drain. When they are cool enough, peel the potatoes and pass them through a mouli or potato ricer into a bowl. Cool completely and then add the egg. Mix it lightly and quickly with a fork. Add 200g of the flour, then add salt to taste. Using your hands, mix quickly to form a dough. Divide the dough into six. Working on a well-floured surface, shape each piece of dough into a roll the thickness of a finger. 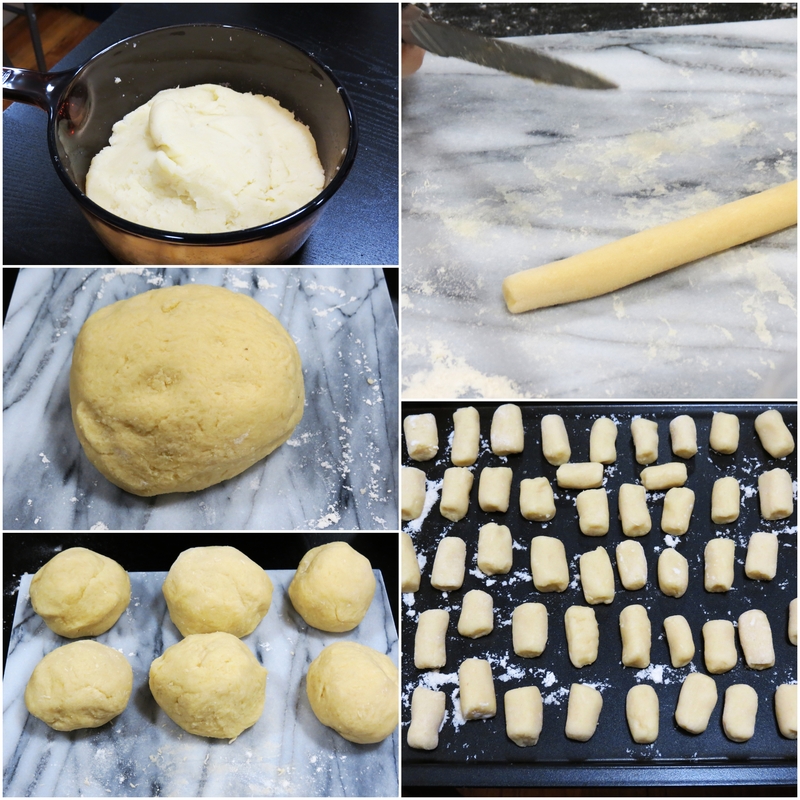 Using a sharp knife, cut each roll into even pieces 2-4 cm long to make your gnocchi. As you cut them, lay the gnocchi on a floured tea towel in a single layer. Do not allow them to touch each other. Boil a pot of salted water. Place the gnocchi on a plate, then tilt the plate over the boiling water and let the gnocchi slide into the water. Do these in small batches if your pot is not big enough. As the gnocchi rise to the surface, lift them out with using a slotted spoon. Preheat the oven to 200 °C and grease the bottom and sides of a ceramic baking dish with a little of butter. 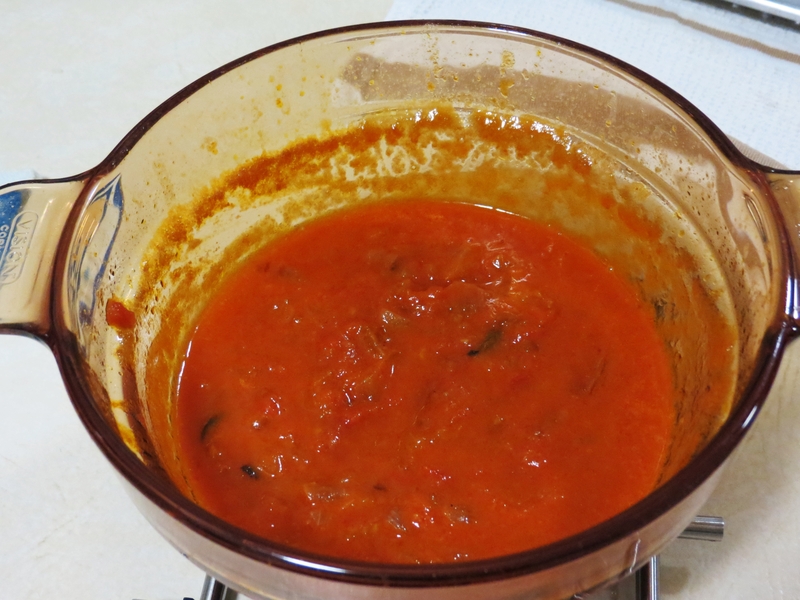 Place 2 tbs of the tomato sauce in the dish and use the back of the spoon to spread it out evenly. Melt the rest of the butter in a non-stick frying pan and add the remaining tomato sauce and simmer for about 5 minutes. Remove the sauce from the heat and add the gnocchi. Mix delicately with a wooden spoon and stir to combine well. Stir in the basil, mozzarella and 2 tbs of parmesan/pecorino. Pour everything into the baking dish, sprinkle with the remaining parmesan/pecorino and bake for about 10 min until golden. Serve immediately.